With winter weather in the forecast, Indiana Department of Transportation Snow Fighters are mobilizing to keep the roads safe. The National Weather Service is forecasting three to four inches of snowfall with two to three inches of accumulation in southwestern Indiana beginning in the early morning hours on Thursday, January 5. The system is expected to start in the eastern part of the state, and move west bringing light snowfall early on and later the potential for snow squalls – or areas of blowing snow that can reduce visibility and create hazardous conditions. Snow Fighters have been monitoring conditions since Tuesday night, with patrols out looking for slick spots as temperatures dropped below freezing. They are also working today (Wednesday, Jan. 4) to pre-treat roads and bridges with salt brine. When snow begins to fall, our Snow Fighters will mobilize and begin snow removal operations in 12-16 hour shifts until the system has passed and the roads are clear. Reduce your speed, especially on four-lane and Interstate routes. Allow yourself extra time to reach your destination. Don’t crowd the plow. 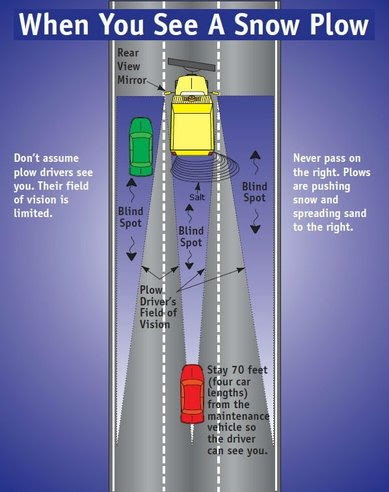 Remember, our plows (#YellowTrucks on social media) have a large blind spot and the driver may not see you if you are too close or riding alongside them. It’s always safer behind a plow, but if you must pass, do it as quickly as conditions allow. Know before you go. Visit INDOT.carsprogram.org to check the latest road conditions. There are a number of reasons for this: the driver may be headed to the starting place for their specific route, they may on their way to refuel, or they could be treating roads with brine or salt. Also remember, our Snow Fighters have designated routes and it takes two to three hours to complete a cycle. You may also see Yellow Trucks with their blades not engaged. Motorists should also note that as temperatures drop below 20 degrees, salt alone becomes less effective. To combat that, INDOT uses beet juice in combination with salt and brine in low temperature situations. More helpful tips are available at winter.indot.in.gov. INDOT urges drivers to slow down and stay alert during winter weather events. For updates and traffic alerts, “Like” INDOT on Facebook at www.facebook.com/INDOTVincennesDistrict and follow on Twitter at www.twitter.com/INDOTSouthwest. For the latest road conditions visit INDOT’s TrafficWise website at http://indot.carsprogram.org.